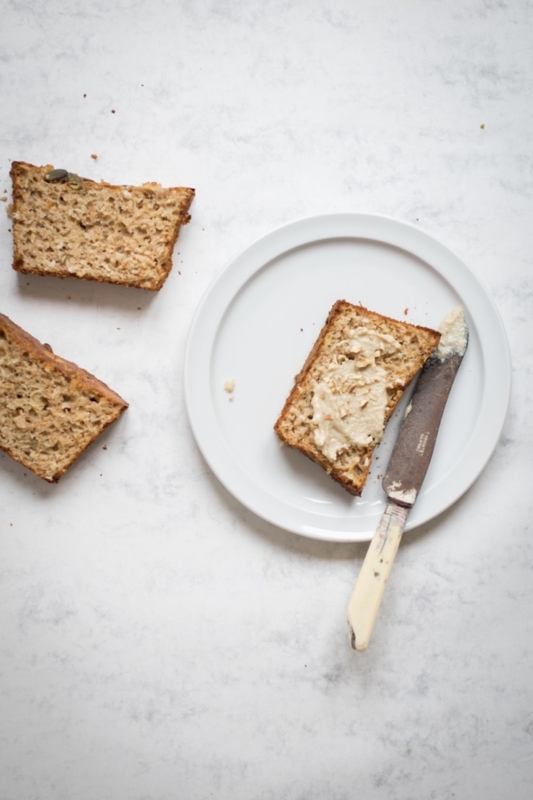 In the “Dumb existential questions” category, I’m quite often wondering why banana bread is called banana bread, rather than banana cake. 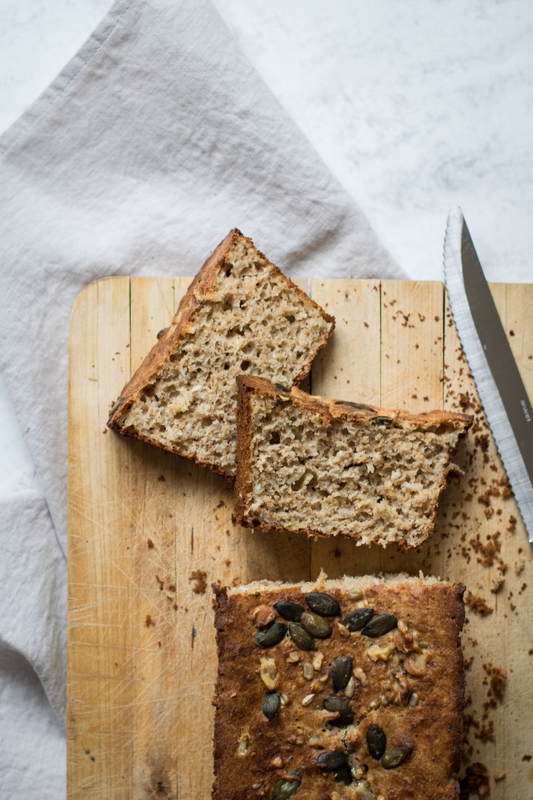 Because technically, “banana breads” are made with all the ingredients you need to make a proper cake, but not totally bread… To dig a bit further into those thoughts, I wanted to try to make a real sugar-free banana bread, with bread ingredients, which imply fresh yeast, and no added sugar. 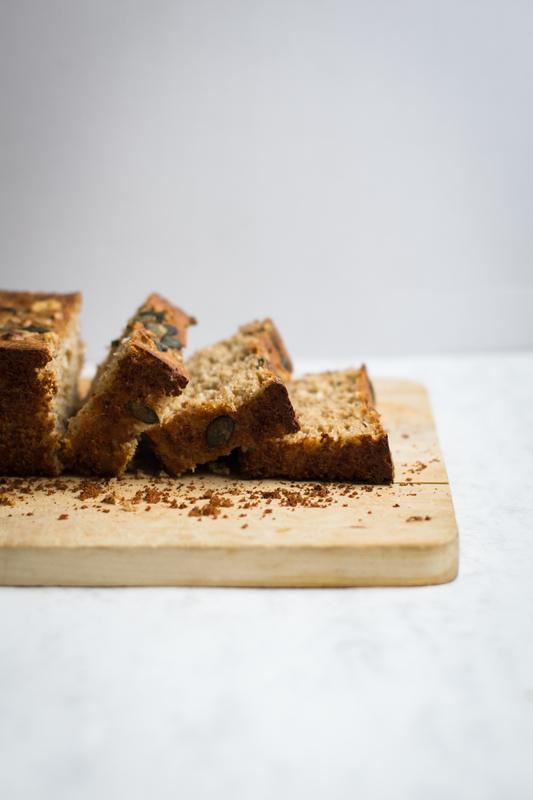 Then here I am, sharing with you guys my whole spelt banana and coconut bread recipe! Every time I bake a banana bread, it throws me back 3 years ago, when I was doing my Erasmus exchange in Finland. I literally landed in the middle of Finnish nowhere, a city called Kouvola. The kind of town for which one even Finnish people would sadly look at you while hearing the name of the city, then asking why the heck did you choose to go there. But it was probably the coolest Finnish nowhere, at least for us. You just need to get used to it, I guess. Or to establish regular gossip & cake breaks through the days , in order to plug the holes between your weekly 10h of classes – yep, you read it well – & the time spent enjoying Finnish wintery bright sun – which actually almost doesn’t exist -, until to start your next party. 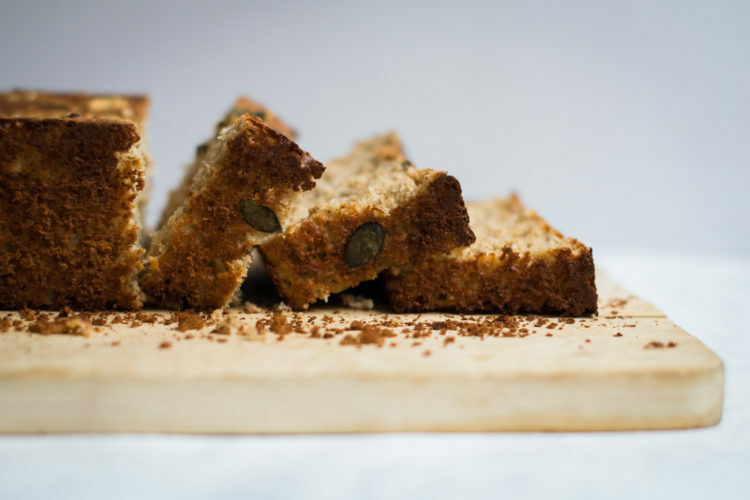 Crêpes, Tatin tarts, Nutella cakes, or this banana bread that I posted at this time, basically everything has been tried. No need to point out that my French friends and I were passing for some alive stomachs, but it’s okay, we are French so people don’t get chocked. And cake time is sacred. We were still trying to keep a good conscious though, while going to gym sometimes. Good old times…If I would be able to do so, I would redo dozens of times this semester in Finland. If you’re interested about it, you can discover here some memories from Lapland in my Decadently creamy hot chocolate with spices & peanut. 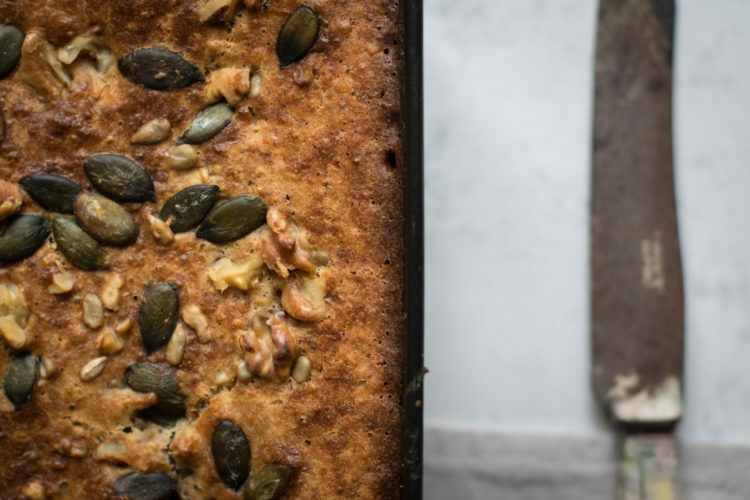 This whole spelt banana and coconut bread is getting dry pretty quickly, so try to eat it within 2 days. 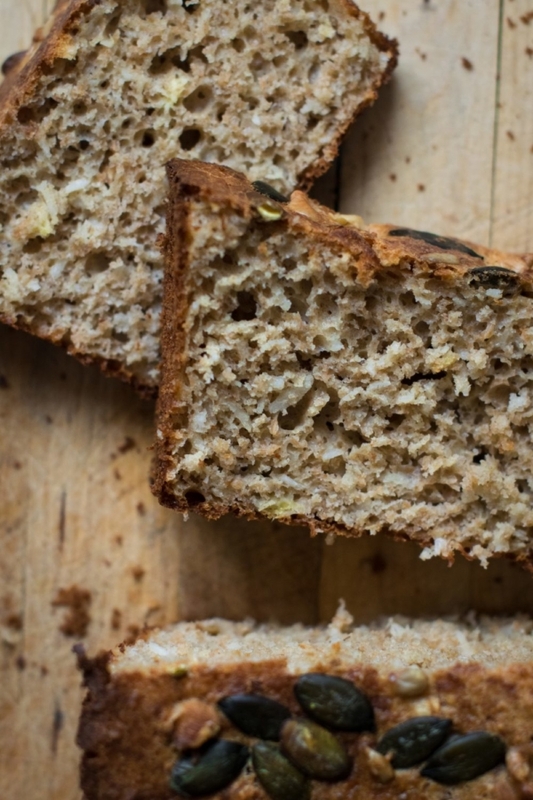 In spite of this detail, bread texture is very airy & way lighter than a classic banana bread. 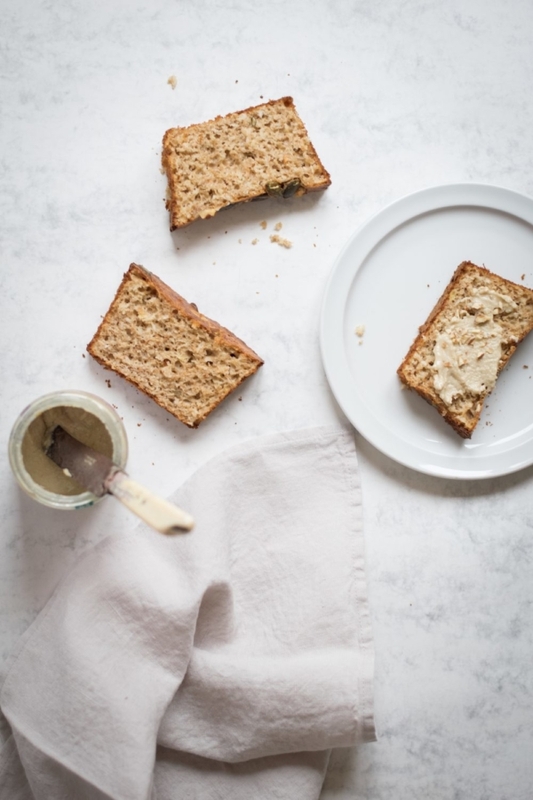 As it’s a sugar-free banana bread, you can allow yourself to spread some peanut butter, jam or chocolate paste on your slices! 1. Warm on a low heat coconut cream. When warm, add yeast and let foam. Once yeast is foamed, add eggs and mashed ripe banane, then stir well. 2. In a salad bowl, stir whole spelt flour, salt, and grated coconut. Add liquid mix, then knead for a few minutes. 3. Pour dough in a greased cake mould, cover with a moist towel and let rest for 1h. 4. Preheat oven to 180C. 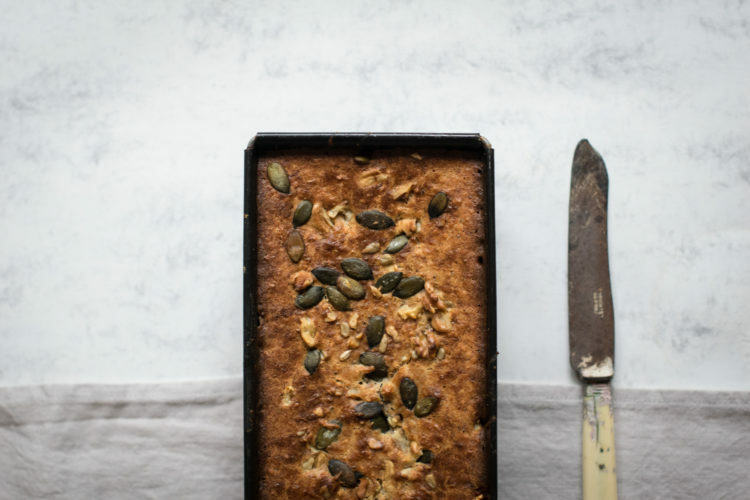 Sprinkle whole spelt banana and coconut bread with walnuts and seeds, then put in oven for 25 minutes. Serve warm or cold. 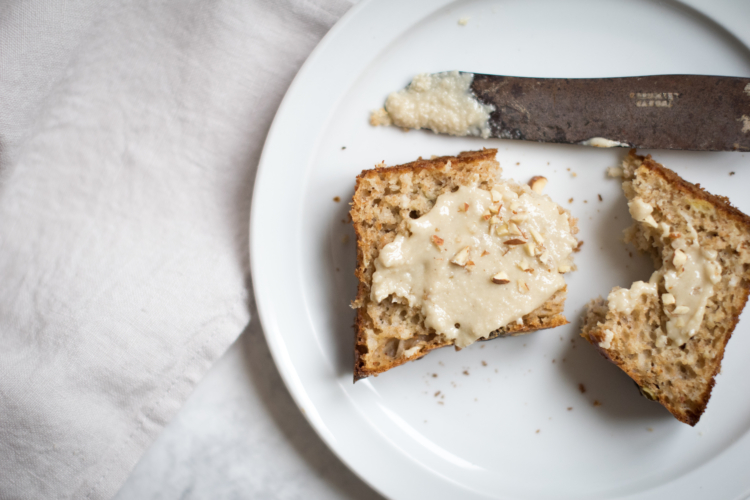 Spread a slice with tahini, it's so yummy!